Just like all good things in life, karaoke never goes out of style! As long as there are catchy earworms and beautiful ballads, there will be karaoke. And now KaraoKing is bringing the sacred art of the “empty orchestra” into any space with this all-in-one iPhone karaoke microphone! The sleek, handheld machine uses Bluetooth to connect directly to your smartphone, so there’s no need for complicated wires and additional screens. And the FREE LED disco light plug-in helps to the stage. In a matter of seconds, you’ll be feeling the music! We may not be able to make you sound exactly like Mariah (hey, we’re not miracle workers! ), but we can make sure that your voice comes through loud and clear! We designed our home KTV microphone with a professional acoustic structure that promotes sound quality, while keeping everyone’s eardrums safe. Together, the superior metal filter head reduces dust and unwanted noise and the 5 watt built-in speaker give you the tools for a pitch perfect performance. With the KaraoKing magic microphone Bluetooth machine, you’ll feel like a total superstar! The present that parties on and on and on! Everyone loves karaoke – even the people who say they hate it. We all know it’s impossible to not sing along when your favorite song comes on. That’s why the KaraoKing karaoke microphone with speaker makes a unique gift that’ll keep the fun going all year long! And we want to make your gift even bigger and better by including some awesome BONUS GIFTS! The FREE Cell Phone Holder, LED Disco Light, and Carrying Case with handle will have everyone singing your praises! Don’t let anything get between you and a good time! Choose the karaoke microphone for iPhone that comes with a lifetime warranty and satisfaction guarantee. Hit all the right notes, and add a KaraoKing to your cart TODAY!
? BELT IT OUT, ANYWHERE – Big, bulky karaoke machines are a thing of the past! The KaraoKing portable wireless karaoke microphone uses Bluetooth karaoke microphone technology to connect directly to your smart phone. It’s compact, professional quality, and comes with some unbeatable FREEBIES, so you can get the KTV singing party started and keep it going all night long!
? AWESOME ACOUSTICS – Whether you prefer Britney, Whitney, or old-school Elton, our karaoke wireless microphone is designed to help you sound like a superstar! The superior metal filter head expertly reduces noise and dust interference, while the 5 watt speaker broadcasts your voice, loud and crystal clear! ?BETTER BATTERY, MAXIMUM FUN – You’re in the groove, singing along to your favorite song, and then your mic goes dead. Nothing kills the vibe faster than a weak battery! Luckily KaraoKing’s 2200 mAh portable karaoke microphone with speaker boasts an impressive 8-hour battery life, so you can keep singing until the sun comes up!
? PERFECT PARTY PERKS – Don’t just get the best portable KTV microphone around, get a BONUS BUNDLE worth over $25! 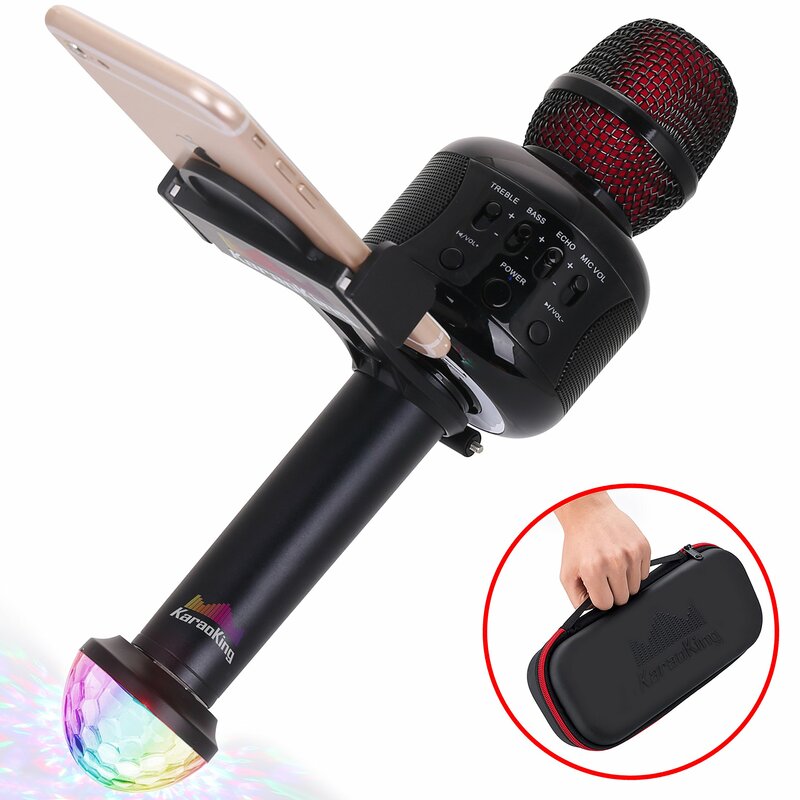 Every order comes with a FREE UNIVERSAL SMARTPHONE MOUNT, a USB Disco Ball Light, and a convenient carrying case – everything you need to throw a home KTV party or take the show on the road!
? GOOD TO THE LAST SONG GUARANTEE – With a never-ending set list of songs at your disposal; you need a portable karaoke microphone for iPhone that can keep up! KaraoKing karaoke machine for kids and adults is up for the challenge, and we guarantee it with our lifetime warranty! –거대하고 부피가 큰 가라오케 머신을 갖춘 IT아웃 소싱은 과거의 일입니다! 캐럴라이징 휴대용 무선 전화기는 블루투스 가라오케 마이크 기술을 사용하여 스마트 폰에 직접 연결합니다. 그것은 작고 전문적인 품질의 프로브리스와 함께 하고 있습니다. 그래서 당신은 KTV노래를 부를 수 있고 밤 내내 계속해서 노래를 부를 수 있습니다. –브리트니, 휘트니, 올드 스쿨 엘튼을 선호하는 독자 분께:저희 노래방은 여러분이 슈퍼 스타처럼 들리도록 도와 주는 것을 돕도록 디자인되었습니다! 우수한 금속 필터 헤드는 소음과 먼지 간섭을 줄여 주며, 5와트 스피커는 소리를 크게 줄여 줍니다! –1메가바이트 짜리 배터리는 당신이 좋아하는 노래에 맞춰 노래를 부르고, 당신이 좋아하는 노래를 부르고, 당신의 마이크는 죽는다. 어떤 것도 약한 배터리보다 더 빨리 그 분위기를 죽이지는 않아요! 캐럴라이징의 22번째 휴대 전화 마이크 폰은 8시간짜리 건전지를 가지고 있어서 태양이 떠오를 때까지 계속해서 노래를 부를 수 있습니다! –최고의 휴대용 DMB수신기를 갖고 있지 마세요. 최고의 휴대용 헤드셋을 구입하면 25달러 이상의 가치가 있습니다! 모든 주문은 무료로 제공되며 USB디스코 볼 라이트, USB디스코 볼 라이트, 편리한 휴대용 가방, 도로 위에 전시회를 여는 데 필요한 모든 것이 갖춰져 있습니다! ?, GOOD THE마지막 SONGGUARANTEE 독자-당신의 임의 처분에서 노래의 끊임 없세트 리스트로, 아이 폰에 대한을 맞출 수 있는 휴대용 노래방 마이크가 필요해요! 아이와 어른 모두를 위한 KaraoKing 노래방 기계는 도전해 보며 우리의 평생 품질 보증과 그걸 보증해 있어요!